Named for James Wolcott, a prosperous businessman during the late 1820's to the mid 1840's, the Wolcott House Museum complex has 7 historical buildings. Of these, only the Wolcott House is original to the site with the others being donated. The original Wolcott house was built by James Wolcott and his wife, Mary Wells (daughter of William Wells and granddaughter of the Ohio Native American Miami Chief Little Turtle. Wolcott House began as a log house and evolved into a beautiful 14-room Federal style mansion between the years 1827 and 1836. Today the house is operated by the Maumee Valley Historical Society and dedicated volunteers that maintain much of the property. The collected buildings represent a broad slice of 19th Century life that makes for an enjoyable and educational visit into Ohio's colorful history. Wolcott House is a federal style house built by entrepreneur James Wolcott. Wolcott migrated to Ohio in 1818 from Connecticut. He was a leading merchant, shipbuilder, judge and politician. The house became a center of frontier activity. The house passed through 3 generations of Wolcotts. The last to live in the house was Rilla Hull who was James and Mary Wolcott's great-granddaughter. It was her wish that upon her death (1880 - 1957) the home be opened for the public's benefit. Rooms on display are finely furnished with 19th Century details. The Frederick House is of the Greek Revival style and originally stood at the corner on East Wayne Street at Gibbs Street, in the uptown Maumee area. Ownership origin is unknown, Jessie K. Fredericks and Percy Frederick b. 1873 to d. 1970. Mr. and Mrs. Charles Reynolds donated the home to the Historical Society and it was moved to the museum complex in December 1971. 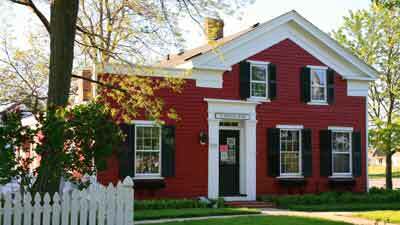 The home serves as the office of the Maumee Valley Historical Society and is the Wolcott House Museum Gift Shop (referred to as "The Talking Turtle" in the 1970's) and Visitors Center. Originally built for the Radical United Brethren congregation in Monclova, the church was moved to the complex in 1985. "Simple, stately elegance" describes our county chapel well. The wood-framed structure has very understated Gothic Revival details. 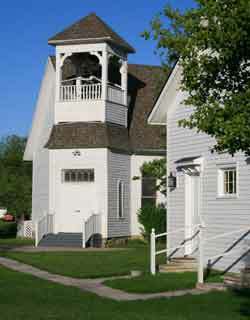 The church qualifies as a vernacular ("homespun") landmark. The original belfry, with its Gothic swept roof, was destroyed in a fire and replaced by a simple, straightforward bell tower. Not everyone lived in the preserved homes we see today as examples of 19th Century life. 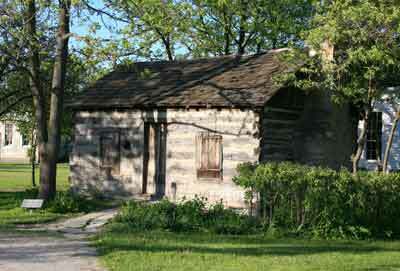 Many people still lived in log houses which is displayed in this preserved example. The log house is the one building in the complex with an unknown builder and construction date. Research has shown through tax records that the house was probably built sometime after 1853, long after the passing of the pioneer period in Ohio history. The building originally sat along the north bank of the Miami and Erie Canal in Maumee, between White and Elizabeth streets. Once known as the Clover Leaf Depot, the train depot was built in 1888, servicing the Toledo and Grand Rapids Railroad. It's original location stood on Sophia Street, just west of Conant Street, in Maumee. The overhanging eaves, ornamental trusses, raised vertical boards, and decorative support brackets distinguish this station as Stick-Style architecture. The station became property of the Toledo, St. Louis, and Western Railway in circa 1900. In 1922-23, that line merged with the New York, Chicago, and St. Louis Railroad (better known as the Nickel Plate). 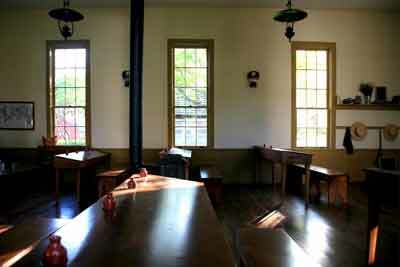 Thanks to the Box family of western Lucas County, the 1850 one-room country school was added to the Wolcott Museum complex in 2006. The schoolhouse's original location was at 10500 Jeffers Road, near the corner of Box Road, Providence Township in Lucas County. The exact building date has not been established but the structure exemplifies the atypical pre-industrial, pre-Civil War building with mortise and tenon construction, gabled roof with (originally) shake shingles, clapboard siding, and three long windows on each side. It was not built by an architect but by the local farmers who sent their children here to school. Thursday - Sunday / 12:30 and 2:30 p.m.